This Website is best viewed while sitting under a palm tree with a cold, fruity "parasol drink" at your side. Loren performing at Green World Gallery. Loren performing at Capt. Tony's Saloon. As an "escape artist," Loren's art inspires and encourages people to escape from whatever is bringing stress and distress to their life - job, traffic, rude people and frightening headlines - and to discover and embody the Paradise that is always only a breath and a choice away. Seen from this perspective, the problems of the moment don't seem so bad anymore. Loren's fifth and current album, Of All the Rum Joints, was released in October 2012. This album, with eleven original songs and two covers, takes Loren's songwriting to new places and new levels. Loren's fourth album, Island Standard Time, was released in November 2010 by Renaissance Island Music. Produced by Kevin Johnston, this album made it onto several "best of" lists, and his song "Worst Day Sailing" was named to the all-time Trop Rock Top 40 on BeachFront Radio in May, 2011. 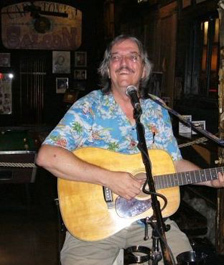 After living, working, and playing in the San Francisco Bay area for over twenty years, Loren can now be found doing valuable research on future songs in the waterfront bars and on the beaches of southwest Florida.